Many people we talk with are asking the same question: Where can I find the inspiration to market through a tough economy? Weve got just the ticket. Actually, make that just the theory  The Cricket Theory. The defining premise is that the more noise you make when times are dark, the better remembered you will be when it is light again. Simply provide the requested information, and well send you a free copy of our cricket poster (as smart as it is charming, if we do say so ourselves). Want to check out the facts, figures, and foresight behind The Cricket Theory? 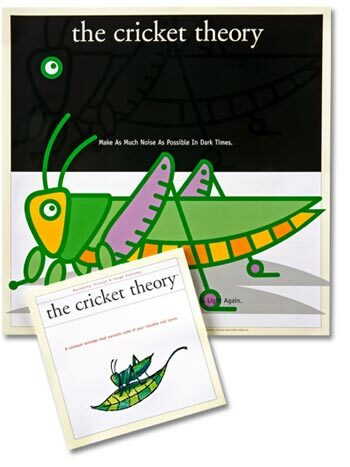 Click here to download a PDF file of The Cricket Theory brochure.